Most of the time, training should be relaxed and sustainable. Sometimes, though, you may want to step things up a notch. In the book Once A Runner, the protagonist Quenton Cassidy goes to the woods of Florida and trains like a freaking monster. 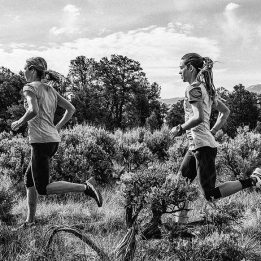 Cassidy undergoes the “Trial of Miles,” the time when a runner grinds off the rubber on the bottom of their training shoes through hundreds and thousands of miles on the trails. The book resonates because it’s one of the most accurate depictions of the loneliness and focus of a long-distance runner. If you read it and think, “That sounds fun/interesting/not terribly horrible and stupid,” then you’re probably destined to be a lifelong runner. Appropriately, the climax of the book (at least in my reading of it) does not involve a race or a relationship. It involves a training session. For nearly a month, Walmsley averaged almost 150 miles a week, often exceeding 50,000 feet of vert. He capped it off with an FKT on Arizona’s Humphrey’s Peak, running a time that seems like it should be fiction. Cassidy’s mentor, Bruce Denton, asks him to do a workout that seems impossible: 60 x 400 meters, all at a blazing fast pace, broken up into smaller sets. Without taking in water at all, Cassidy completes the mind-blowing workout, peeing blood afterward (not a doctor-recommended training plan). The implication for Cassidy is that he entered the workout as a kid and finished it as an adult. The implication for the reader is, what results from the Trial of Miles is not the point. The Trial of Miles is the point. Don’t try that workout at home, just like you wouldn’t duplicate Tom Cruise’s stunts from Mission Impossible. It’s realistic fiction, but it’s still fiction. However, Cassidy’s famous workout comes from a place of truth. Sometimes, done in moderation, the biggest, hardest workouts can help spur performance breakthroughs. Right now, the trail running world is seeing something similar. Jim Walmsley, winner and record breaker of the 2018 Western States 100 and possible superhero, just finished a training block at altitude in Colorado that would make Cassidy crap himself. For nearly a month, Walmsley averaged almost 150 miles a week, often exceeding 50,000 feet of vert. He capped it off with an FKT on Arizona’s Humphrey’s Peak, running a time that seems like it should be fiction. If Cassidy were real, his homepage would probably be Walmsley’s Strava. Don’t try that at home, either. Walmsley is taking strategic risks to try to spur performance breakthroughs before toeing the line at UTMB in a couple weeks. But there is a lesson that any runner can learn from Cassidy and Walmsley’s crazy training. Big training stimuli can lead to big adaptations (but they come with big risks). Physically, the occasional big training session or block can supercharge all of the normal adaptations from training—improving aerobic capacity, lactate threshold, resilience and endurance. There is the added benefit of a possible supercompensation effect—large, sometimes non-linear adaptations to stress. The flip-side of big workouts is that overtraining is on the same spectrum as supercompensation, so they need to be preceded and followed by adequate recovery. Plus, they should only be done by advanced athletes looking for an extra fitness boost. The biggest benefits may be psychological, after all: pushing back self-imposed limits (or even recalibrating the controversial “central governor,” proposed as a brain-based mechanism for endurance performance, as described by Timothy Noakes in this 2007 article from the journal Sports Medicine). However, Cassidy and Walmsley are superheroes. What about a regular, motivated, healthy trail runner looking for a breakthrough? Here are 6 potential workouts that could induce the supercompensation effect depending on your background and goals. Just remember to do these at least two to three weeks before any key event (no more than once a month or so) and make sure they are preceded and followed by at least two days of easy running or rest, with a normal warm-up and cool-down. For coaching context, I’ll give these workouts just a couple times per year, and just to runners with a longterm history of healthy running. When I first got into running, a mentor said the best workout you could do for the mile to the marathon was an hour hard. Let’s start with the safest big workout on the menu. The Power Hour is all about getting comfortable being uncomfortable, improving power output at aerobic effort levels, along with providing a lactate threshold stimulus. When I first got into running, a mentor said the best workout you could do for the mile to the marathon was an hour hard. I think that my own personal Bruce Denton was probably right. After a warm-up, start the Power Hour relaxed and purposeful, as if you’re at the start of a marathon. Progress as you go until you are feeling breathless and fatigued. End it with a push that leaves you ready to quit running and pick up a different hobby that involves less emotional distress, like watching TV news. The Power Hour can be a great workout 17 to 24 days out from a race, especially for those races from a marathon to 50 miles. Just make sure you pace carefully enough to progress your effort at the end. I first saw this workout in 2016, completed by Hayden Hawks before his 2nd place finish at the North Face 50 Miler. He did it on the course, keeping the easy sections up-tempo enough that he set some fastest times on the climbs and descents of the Marin Headlands. Doing this workout on trails can induce race-specific adaptations, primarily related to resilience and power output on tired legs. On the intervals, think of an effort you could maintain for one hour. They should be relatively easy at first and very difficult at the end. This is a great workout approximately four to six weeks before race day. Just make sure you listen to your body and stop the efforts if you have any injury concerns. 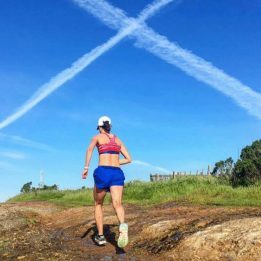 The Hill Beast is a workout often completed by South African trail star Meg Mackensie, an athlete currently in the top-10 of the Golden Trail Series. Mackensie does the first portion of this workout, the hill repeats, only adding the final hill once or twice a year. It’s all about power output when fatigued, starting around 1-hour effort and getting harder from there. The final 10-minute all-out hill will often be the same pace as the first effort (or even slower), but it may feel immensely harder. Because this workout involves uphill efforts, the impact forces are lessened, so it’s okay to do closer to race day. 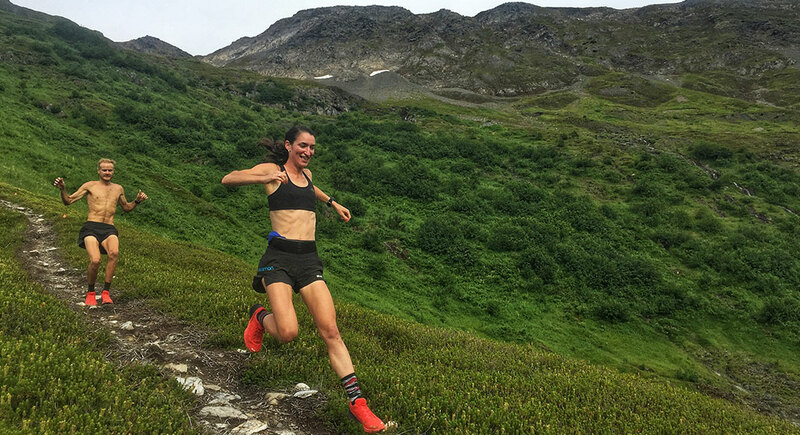 Mackensie has excelled with this workout just 10 days before big skyraces with lots of climbing, though two weeks is a safe bet for most athletes. Long tempo runs like the Power Hour may not be advisable for some athletes because they are mentally exhausting. Plus, they are less beneficial when running economy isn’t great to begin with because form can drop off before the aerobic system is maximally stressed. Workouts like 10 minute intervals break up the tempo so that a larger portion of the overall effort is done with good, economical form and the overall pace/power output is stronger. Similar rules apply as the Power Hour, with the added wrinkle that this workout can be incorporated into a long run. Most of the ultramarathoners reading this article will nod their head at this type of block. It’s a staple of ultra plans, from the Western States training camp to what Walmsley just finished in Colorado. The theory is that the muscular, biomechanical and neuromuscular fatigue combined with glycogen depletion is the best way to simulate extra-long races without actually going extra far in training. An example prior to a 100 miler might be the Western States camp, which is 50k-20 miles-20 miles on the course a month before race day. I will often have athletes training for ultramarathons do 2-day weekend blocks 3, 5, and 7 weeks out from race day. However, there is no magic to the madness. Just make sure there is some method to whatever madness you choose. Canova blocks are complex training double days used for complex reasons by one of the top coaches in the world, Renato Canova. The basic theory is that the glycogen depletion in the PM combined with the muscular fatigue can induce performance breakthroughs later in the training cycle. Canova will have some of his athletes do blocks two or three times during marathon training. For a great description of a Canova Special Block, see this blog post from 2:14 marathoner, Nate Jenkins. Canova blocks usually involve tempos in the AM followed by a tempo and intervals in the PM. 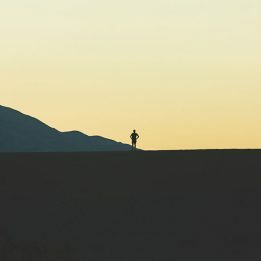 The few times I have used these principles for trail runners, I have found that hills in the AM help induce muscular fatigue without the impact risks. Also, while Canova blocks sometimes involve special dietary considerations between workouts, I tell athletes just to eat plenty, as they normally would. Does it work? Maybe (that could be said about any workout). Of the athletes that I’ve had do this type of workout, some have won prestigious ultramarathons shortly after, some have performed as expected without a breakthrough, and one finished nearly last place (me at the 2017 Trail World Champs). If you do any sort of double workout, please research more prior to taking the leap (it could lead to injury or overtraining). The same disclaimer goes for all of these workouts. None are necessary or risk-free. There is uncertainty in how every workout will interact with your unique physiology and life circumstances. It all gets back to the Trial of Miles. Will it always end with a breakthrough race for every athlete? No. Sometimes it will even end disastrously. But the point isn’t the destination, which is subject to too many variables to count. The point is the journey. And sometimes, as Quenton Cassidy learned, the most fulfilling journeys can involve taking the biggest risks. —David Roche partners with runners of all abilities through his coaching service, Some Work, All Play. His book, Happy Runner, is co-written with his wife, Megan, and available for pre-order now at Amazon. As you pointed out, these types of workouts can be helpful to break through psychologically even if physiologically you are already at a higher plane of fitness. You can’t achieve what you don’t believe. You are awesome Jake, thank you! The timing of this article is perfect! Regarding the “Hill Beast” workout, I see how this style of workout would provide stress above what would normally be experienced in a race and make race day climbs feel “not as tough as that workout I did”. In the strange way that only runners could appreciate I’m looking forward to trying this.? Is there any value in long hill intervals to increase endurance, say 30+ minutes? I’ve got a race coming up with some long steep hills and I’m trying to figure out a good way to prepare. All look ‘fun’! but missed my favorite hurts-so-good workout… Lactate Sandwich: 10-20 min lactate threshold run, followed by a med length run (1 hour-10 mile range)…. topped off by a second 10-20 min lactate threshold run. That second LT will teach you how to run hard on gassed legs, make you feel like a puddle of garbage, and make you confident you are ready to take on the world.